You can use a pen instead of a mouse in many areas of Cakewalk. The Piano Roll view also offers enhanced support for a pen’s eraser functionality and pressure-sensitive tip when drawing Note events and continuous controller data. Pen input is intuitive and feels natural, and expands on the versatility of multi-touch when you want even greater precision. If you are already using a control surface or touch screen along with keyboard shortcuts, adding a pen to your workflow will be easy to adopt and can greatly improve your efficiency. Cakewalk fully support a pen’s right-click button, eraser functionality, and pressure-sensitive tip. Eraser (Top). To erase, flip the pen over and use the top as an eraser. See To delete events with a pen. Right-click button. This button acts like the right-click button on a mouse. Hold the button down as you tap the screen. See To open context menus with a pen. Eraser button. Hold down the Eraser button and move the tip over the area you want to erase. See To delete events with a pen. Tip. The tip acts like clicking with a mouse. Move the tip over the area you want select, then tap the screen. Many pens also support different amounts of pressure when applying force to the screen. Cakewalk responds to pressure by adjusting velocity or controller data when drawing Note events. See To draw events with a pen. Note: Keyboard shortcuts work in conjunction with a pen just like they do with a mouse. To draw, simply tap the screen and move the pen. Many pens support different amounts of pressure when applying force to the screen. Cakewalk responds to pressure by adjusting velocity or controller data when drawing Note events. If the Controller pane is closed, or the Velocity lane is selected. Pen pressure adjusts the velocity of the Note event being drawn. If a continuous controller lane is selected. New controller data is created for the duration of the drawn Note event. Pen pressure determines the controller value. Tip: You can use a pen to tap piano keys in the Piano Roll view to audition pitches. Use pressure to adjust velocity. 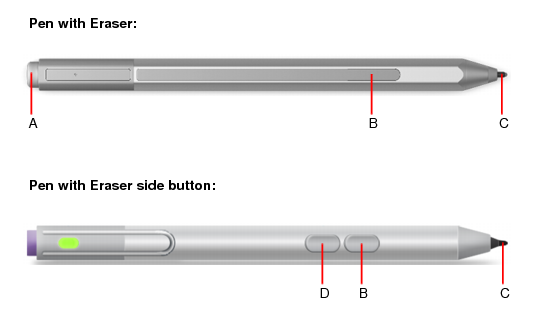 Most pens have either a dedicated Eraser side button that is used in combination with the tip, or the Top button functions as an eraser when the pen is flipped over. Eraser (Top). To delete events, flip the pen over and use the top as an eraser. Only events that are touched will be deleted. Eraser button + Tip. Hold down the Eraser button and move the tip over the events you want to delete. This special “touch” eraser mode is always available, regardless of which global tool is selected. Because the pen tip acts like clicking with a mouse, you can also use all other delete gestures that are supported by the Smart tool , Freehand tool , and Erase tool . For details, see Using the Smart tool on PRV notes, Using the Freehand tool on PRV notes, and Using the Erase tool on PRV notes. The pen tip acts like clicking with a mouse. To make a selection, move the tip over the area you want select, then tap the screen. To open a context menu, hold the pen’s Right-click button down and tap the screen where you want to open the context menu.